Over the years, several smokeless tobacco cessation and prevention techniques have been tried with varying levels of success. Some of them include:1. Education- One of the easiest and first lines of defense in cessation is to educate them on the dangers of tobacco. Give your patients literature from the American Cancer Society and the National Cancer Institute. We have some pamphlet and booklet suggestions in this web site. Posters, pamphlets and repeated reminders (i.e. intervention) from health professionals to their patients to not start using tobacco can be very influential. Encouraging and educating young people regarding non-tobacco use can also help that person become influential to their peers. Be consistent- Ask every patient (especially adolescents) on each visit if they use tobacco. If they don’t, praise them for non-use and urge them to continue avoiding tobacco. If they do chew, briefly inform them of the dangers of tobacco, provide them literature and ask them if they want to quit. Consistently asking someone about their tobacco use, especially young adults, offers many opportunities for intervention. “Yes, I have (or do) use chewing tobacco” – It can happen! The best you can do now is to find out how much they are using, why and then tell them briefly about the dangers of tobacco and that they should think about making their own decision to quit. There are no good reasons for them to be chewing tobacco. Offer them information about the dangers of tobacco and try to find out why they chew. Consumers may order samples of Mint Pouches for $1. If you are going to have a special promotion such as a health fair or other tobacco-related event, please call the Oregon Mint Snuff Company at 1.800.EAT.MINT * 1.800.328.6468 with your ideas. Practice SAFE SNUFF with Mint Snuff. While about 75% of health providers think it is a good idea to tell patients about tobacco dangers, only about ten percent routinely do so. Research shows that the reasons they don’t get involved are a combination of not feeling confident about the subject, questionable goals of doing so, afraid of a negative reaction from the patient, feel that the patient would be offended, there is not enough reimbursement to get into cessation or they just don’t have enough time. Kids hear about chewing tobacco at an early age due to tobacco advertising, store displays, friends and even unknowing parents introduce smokeless tobacco to some kids as young as 3 to 9 years. By the time a child is ten, they may know what smokeless tobacco is but they may not understand what the dangers are. When a health professional asks a child if they know about, or even use smokeless tobacco, a golden intervention opportunity exists. When a health professional identifies that a patient is using tobacco, there are many intervention opportunities available. The obvious one is to show them how evident it is that they chew tobacco by pointing out gum recession, tooth decay, leukoplakia or other histological effects caused by tobacco use and offering a brief message that they should quit. Graphic pictures, brochures, videos or other information could be provided, depending on the time available and receptiveness of the patient. Asking whether or not they know how dangerous spit tobacco is, often brings the surprise reaction that they don’t know that smokeless is a health risk. If the patient doesn’t use tobacco, a professional can take a moment to congratulate them for non-use, tell them their own position on the use of tobacco, and solicit a promise from them that they will never use tobacco. If we can keep a child away from tobacco until they are about eighteen, there is a very good chance that they will never use tobacco. Research shows that one of the main reasons young people start using tobacco is social pressures or imagery. Kids usually get their first “dip” from a friend or family member. Shockingly, some kids have admitted they are willing to risk their health in order to have the circle on their back pocket or to just “fit in” with other young chewers. Trying to compete against this peer pressure or social imagery can be perplexing for health advisors. Dealing with the social and behavioral aspects can be tough. For kids who chew for social or image reasons, a professional can either try to convince them to quit “cold turkey” or offer an alternative that provides them the same social imagery and behavior but is harmless. Some of these alternatives are sunflower seeds, bubble gum and sugarless candy which, although somewhat acceptable, don’t offer the same perceived benefits as their chew. 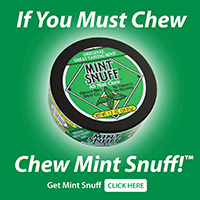 Two alternatives which are safe, food grade products are Mint Snuff All Mint Chew and Mint Snuff Pouches produced by the Oregon Mint Snuff Company (1-800-EAT-MINT; www.mintsnuff.com ). These products are made from mint, not tobacco and offer the same look, feel and behavior as tobacco. By giving a chewer Mint Snuff, a professional is meeting the user “half-way” and providing a positive experience during the intervention phase. Naturally, it’s better if the chewer didn’t do the behavior at all, but if they are going to chew anyway, it’s better they used mint instead of tobacco. From November 1990 through December 1998, the Oregon Mint Snuff Company has given over 1 million free cans of non-tobacco chew as well as thousands of educational posters and brochures to dentists, hygienists, county health departments, and other health professionals. Over 10,000 dentists, hygienists, and other health professionals have received samples and recommend Mint Snuff to their patients. Why do people chew tobacco? There is no one way to help people quit chewing tobacco just as there is no one reason they chew. Like cigarettes, there seems to be the same three main reasons for chewing: social/psychological, behavioral and physical (nicotine addiction). Another interesting example is Alaskan Indians, who would use Mint Snuff instead of tobacco as long as it was provided free – but when they had to pay any amount of money for it, would chew tobacco instead. Smokeless tobacco intervention can be a good practice builder. Health practitioners offer help to people for a problem that is widespread and lacks conventional assistance. Quite often the person asking for help is not the chewer, but rather a parent or friend who wants to help someone they know quit tobacco. Dental practices that let their community know that they are concerned and have possible solutions to this problem are doing great public relations and a great public service.